Hepatitis viruses come from diverse groups but share a specific tropism (predilection) for liver cells. Apart from acute liver destruction, some have the capacity for chronicity, leading eventually to cirrhosis or even hepatocellular carcinoma. The most important in Southern Africa is Hepatitis B, with a prevalence of 5 -7%, but vaccination should reduce the burden of disease in the next few decades. Clinical data: The patient was a 40 year old man, admitted with a diagnosis of fulminant hepatitis caused by hepatitis B, who rapidly lapsed into hepatic coma. Apart from jaundice he also developed an uncontrollable hypoglycaemia, a bleeding tendency and renal failure. 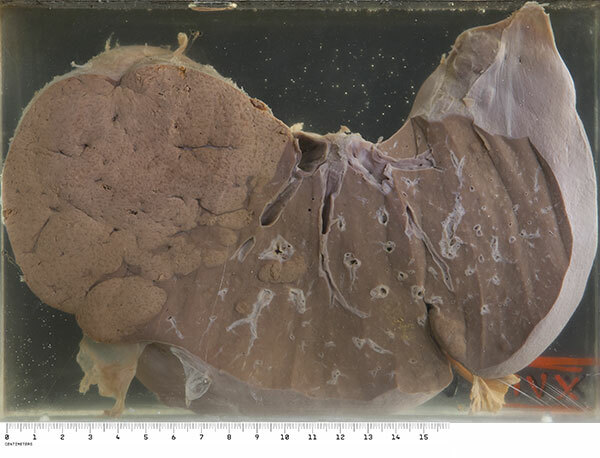 Macroscopically: His liver was greatly reduced in size (1025g) and on section the remaining regenerated parenchyma is represented largely by a nodule in the right lobe, and occasional smaller nodules elsewhere. The remaining bulk of the tissue had a fleshy red appearance. Microscopically: Microscopically the liver tissue was composed of collapsed stroma and proliferated bile ductules with no surviving hepatocytes. Comments: The pathogenesis of hepatocellular injury in hepatitis B is mediated via cytotoxic T-lymphocytes that recognise viral antigen on the surface of infected cells and precipitate cell death. 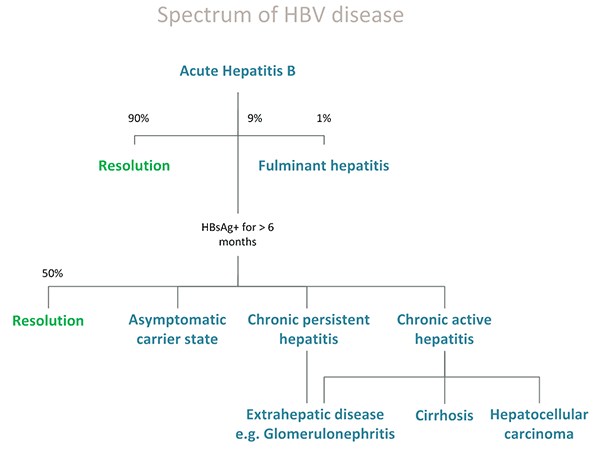 “Fulminant” hepatitis B (i.e. 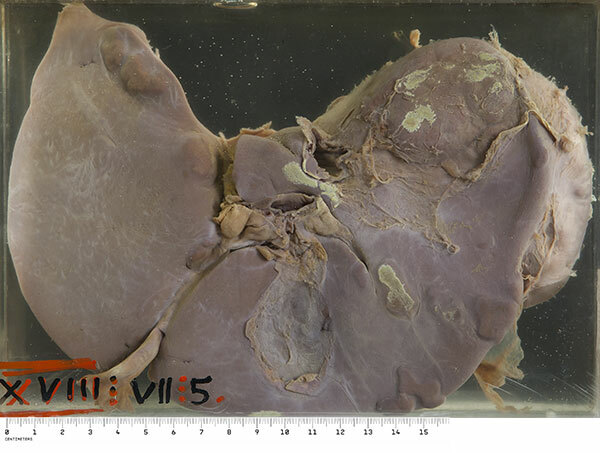 massive necrosis of liver parenchyma) is a rare outcome of hepatitis B which occurs in about 1% of infections, and results in acute liver failure. Acute liver failure in general is rare (1-6 cases per million of population per year), and occurs mainly in young adults. Drug-induced causes are commonest in the developed world and infective causes, especially Hepatitis A, B and E viruses, are commonest in the developing world. The mortality rate is high, although emergency liver transplantation has improved the outlook. Bernal W et al. Acute liver failure. Lancet. 2010.376:190-201. Clinical data: The patient was a 56 year old man, who developed a gradually deepening jaundice, progressing to liver failure and then renal failure. Terminally he developed haematemesis and died. 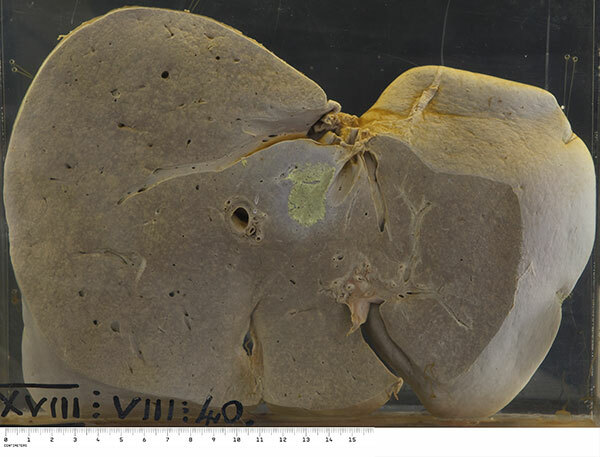 Macroscopically: His liver (1755g) is deeply bile-stained, and shows a subtle micronodular sclerotic pattern; diffuse small yellow flecks suggest an associated necrosis. Microscopically: A review of his previous liver biopsy (taken 1 month before his demise) showed an intense portal tract infiltrate of lymphocytes and occasional eosinophils, accompanied by piece-meal hepatocyte necrosis. Marked hepatocyte regeneration was present as were numerous bile plugs and focal hepatocyte necrosis. Comment: The macroscopic and microscopic appearances are consistent with a chronic active hepatitis, progressing to an early micronodular cirrhosis. In view of a negative screen for auto-immune disease and negative serology for Hepatitis B, no specific aetiology was identified at the time, but “non-A, non-B hepatitis” was suggested. The aetiology was most likely hepatitis C, a virus that had long been proposed to exist, but was finally identified by molecular techniques in 1989, six years after this patient’s death. "Chronic hepatitis" has been divided into a (mild) chronic persistent hepatitis (CPH) and a more severe chronic active (or chronic aggressive) hepatitis (CAH). These are not different diseases but reflect different degrees of necroinflammatory activity - the distinction influences patient management.